The following are some tips and advice on how to sharpen a dull knife and how to make a knife that’s already pretty sharp – even sharper. Just about everyone has at least one knife. More than likely you have several knives or more, each of them them serving a range of uses and purposes. Every Knife maker has his own rules, and they are always and often debated. But mine works, it works anywhere, and costs very, very little. My personal preference in knife sharpening is as follows. First, I recommend to always choose a knife of high carbon steel. 1. It’s easy to sharpen anywhere (which means in the field and not some fancy shop like mine or a souped-up workshop). 2. Carbon Steel holds an edge better than stainless. To keep your sharp knife sharp, take good care of it. Keep it clean and oil it regularly. Olive oil is my preference because it’s cheap, very light weight and not gummy. You can put it in your mouth (which is key and can’t be done with most expensive gun/knife oils which always blows my mind). To keep your sharp knife sharp, don’t bang it on anything harder than knife’s edge. Your main culprits in nature are bones and rocks. First, lets talk about sharpening a knife that’s already fairly sharp. Strop it every evening on a good old piece of leather after you have used it. 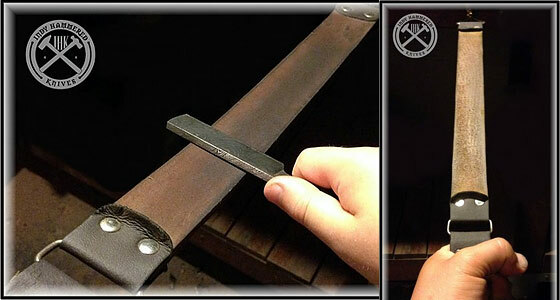 This is the main reason I wear an old leather belt (keeps an already good edge razor sharp with very little effort). Nothing keeps your knife edge sharper than a regular stropping and is a must have for anyone who uses and keeps their knife or straight razor sharp! Stropping is a motion which pulls the cutting edge away from a substrate. The direction of stropping strokes: drag the edge backwards over the strop. In other words, it’s a “trailing stroke” by pulling the knife edge rather than “leading strokes” (as you would with a stone or rod). Use a light touch and maintain the angle of the knife edge. Alternate sides with each stroke. Important: Maintain the bevel angle while stropping (or any sharpening technique). 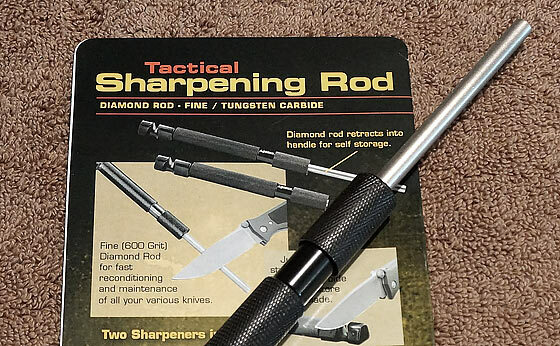 Okay if you don’t have a sharp knife or if you have incurred some damage from hitting bones, rocks, or other, and need to reproduce a microscopic edge, then my only choice for knives is to use diamond and ceramic sharpening rods. A rod works better in my opinion due to the fact that every blade has a different degree of bevel or angle. The rod allows you to let the edge guide you while keeping the rest of the knife away from the sharpening device. The diamond rod is for a knife blade with serious damage or very dulled blade. The ceramic rod is for “freshening up” a dull-ish blade. I keep one on my bench as well as in the kitchen and field pack. I keep these two rods in my pant pocket at all times when in the field. Primarily the tactical rod. The ceramic is actually just a rod. 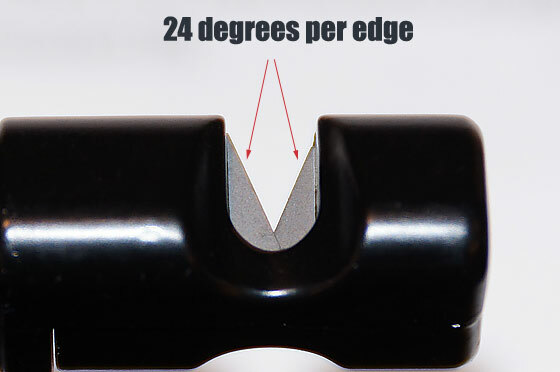 [Ken adds: ] I measured the angle of the built-in tungsten-carbide blades (24-degrees /side). Although James didn’t mention it, the use of these blades should be reserved for a severely damaged knife edge. So, what’s the secret to sharpen a dull knife? 3. Then strop on the leather for a razors edge. Read more: If You Could Only Buy One Best Survival Knife, What Would It Be? Have always preferred carbon steel knives over stainless. Much easier to get and maintain a super sharp edge. I carry two sharpening tools. One is a pocket diamond rod I’ve had for years, the other is a small (almost miniature, about 4 inches long) butcher’s steel. I consider that little “steel” indispensable in the field. It is not the diamond coated or ceramic “steel” popular today, rather it is identical to the older steel butcher’s friend of days gone by. If you have taken the time and required effort to put a good edge on your knife, you can restore that edge quickly and easily with this tool. I use a strop also. I prefer full grain leather belts with a little oil worked into it. I prefer true hollow ground blades (not those that just appear to be hollow ground, but are just a more pronounced bevel. I carry a stainless knife for everyday utility, but my serious working knives are high carbon, non-stainless, steel. I use a strop more than anything, use all sorts of knives in my leather shop, all have high carbon steel blades, i use the strop a lot, i have a power strop on a king arthurs tools guenivere, basicly a two sided grinder with drill chucks mounted on it, have the power strop on one side and a fairly hard polishing disk on the other, i use the polisher most of the time, with white or green compound, white on the power strop. The polisher keeps stuff razor sharp, amazing really. In the field i use a diamond hone, if the knife is razor sharp to begin with its easy to keep it cutting well. I have the original “Lansky sharpener” that I bought back in the mid-1980’s. It still works great, adjustable from 17 to 30 deg angle. I’vw never done the belt thing . I worked in a beef packing house for years. We used the chicago black stee carbonateel knives. I had a job trimming lung fat. To get an edge they had a grinder. . a gray stone was used to finish off the edge. We used smooth steels which we worked with 80 grit emery . I stoned my knife very lightly and did the same with the steell. to test sharpness i ran a leanght of paper towel , grabbed the handle at the back end of the handle. if it caught in the towel i stoned it some more and steeled it again When the blade cut smoothly it cut the fat like nothing. I don’t do that anymore . Anymore all blades are stainless which are harer to ge an edge. I still sharpen the same way. I have a stanless steak knife wit a 4″ blade. Filleting fish is like cutting warm butter. Gutting deer skinning and deboning them are nothing. A lot of people figh their knife when doing thisi. Most people never learn hot to sharpen knivesand will never learn the fine art of it. Some of us that DO get it and have sharp knives in our kitchen also have previous experience working in the kitchens of others be it a church kitchen, fine dining establishment or catering service. My primary job at paid gigs was as a prep cook and baker so I had to cut and wash a lot of vegetables and fruit, mix marinades and pre-spice the meat. Highest pressure job: Cooking for 26 hungry firefighters. When traveling to another kitchen I have never been to, I generally bring my own knives and diamond hone stick which has some 10 inches of diamond impregnated honing surface and a hard plastic handle. I will bring an inexpensive 8 inch Chefs knife, a small paring knife and a medium ( 5 inches of cutting surface) sized santoku blade. I bring Chicago Cutlery with me because it is common, easy to find, inexpensive and easily replaced if stolen. In commercial kitchens, I have had more problems with theft than actually wearing out blades. I almost forgot to address the issue of stropping the blade periodically: I use my old Carhart leather belt because I grew too fat and had to get a new one.